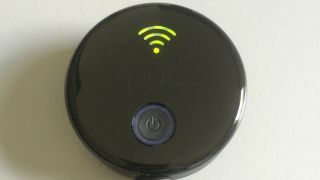 How does this Indiegogo-funded Wi-FI device shape up? PUC feels reaonsably solid, but probably wouldn't stand up to being hit with a hockey stick. Minneapolis-based Zivix is a developer of music-related iOS and Android apps that's made the move into hardware with a couple of crowd-funded (Indiegogo) projects, both of which succeeded in smashing their investment targets last year. The JamStik looks to be a pretty nifty wireless guitar-style controller, but it's PUC that we're looking at here - a wireless MIDI interface via which anything with a 5-pin MIDI output socket can be hooked up to your iOS device, Mac or PC, sans cables (apart from the one between the MIDI device and PUC itself, of course). Android, it should be pointed out, isn't supported. The name comes from the PUC's resemblance to a hockey puck. It's a thick, palm-sized circular block that, although plasticky, feels solid enough. The base is rubberised, giving it a bit of grip, and is removed entirely to gain access to the battery compartment. Also in the box are two AA batteries and a 1m MIDI cable. "PUC is a wireless MIDI interface via which anything with a 5-pin MIDI output socket can be hooked up to your iOS device, Mac or PC, sans cables." So, PUC is battery-powered, obviously, for up to ten hours, but there's also a micro USB port onboard for mains powering (and nothing else - ie, it won't receive MIDI through USB). The top surface hosts the backlit power button and an LED 'ladder' in the shape of a Wi-Fi icon, while the side of the unit houses the 5-pin DIN MIDI port. Getting up and running with PUC could hardly be easier. Turning it on launches an ad hoc Wi-Fi network (2.4GHz - we got a Transmit Rate of about 50mbps) that the target computer or iOS device joins in the usual way. On Mac, you then launch Audio MIDI Setup, start a Network MIDI session and connect it to PUC (the LED ladder animates until the connection is made, whereupon it 'solidifies'), which then appears as a MIDI input in all your MIDI-receiving applications (DAWs, standalone instruments, etc). On iOS, you download and run the free PUC Connect app from the App Store, which runs in the background, making PUC available as an input to any CoreMIDI-compatible apps running on your device. Indeed, many of them connect to it automatically when launched. And that's all there is to it! You then plug a MIDI instrument or controller into PUC's MIDI DIN socket and play/tweak your soft synth, sampler, effect, DJ app or whatever, the result being exactly the same as if it was physically connected, as you'd expect. The LED flashes red with MIDI input, which looks quite cool at first but quickly becomes annoying - shame that can't be turned off. PUC actually uses different wireless connection protocols for Mac/PC and iOS. For Mac and PC, its RTPMIDI, an established MIDI-over-network standard. For iOS, it's Zivix' own Z-Fi protocol (hence the PUC Connect app), which is said to beat RTP performance-wise and is being ported to Windows and OS X. We tested PUC with a MIDI drum kit (Roland V-Drums) and a controller keyboard (Novation Impulse 49), triggering various apps and software instruments on an iMac, a MacBook Air and an iPad Air. Strangely, the input to the iMac was plagued with lag way beyond simple latency, resulting in late notes all over the shop, to the extent that we wouldn't have even wanted to use it to jam around in the studio, let alone in a mission-critical live performance situation. We didn't manage to get to the bottom of this, although turning off all nearby wireless gear made no difference, so radio interference seems an unlikely cause; and it was definitely nothing do with the Mac platform itself, since the MacBook Air (running the same version of OS X) suffered no such problems, proving resolutely stable. The iPad also linked up perfectly with no drop-outs or other issues whatsoever. Latency-wise, Zivix claims impressive figures of around 7ms on Mac and 22ms on iPad (see this PUC latency test video), and hooked up to the V-Drums, our virtual Mac drum kit did indeed feel a touch more responsive than its iPad equivalent. The difference between the two with synths and other melodic instruments - being more forgiving in terms of 'micro-timing' - was all but imperceptible. PUC is available for preorder now, priced $129.99, and if the thought of cutting the cable between iPad or computer and MIDI interface appeals, it certainly appears to be an effective, straightforward and solid solution. The iMac lag is a puzzler, we really wish it accepted USB MIDI as well as 5-pin DIN, and we'd like to be able to turn those maddening red LEDs off, but those niggles aside, this a well-made, well-presented and effective gadget at a reasonable price, given its unique functionality.